You want a watch that will support you whether you’re trekking through the mountains or fishing on the high sea? The Casio ProTek Smart Watch has you covered in all environments! The multisport smart watch has a built-in, low-power GPS that receives positioning data from three satellites and displays your current position on a full-color map. The map interface allows you to write memos, display footprints, record markers or use voice input to make notes when connected to a smartphone and you can download maps to access when you’re offline or out of range. The smart watch has a tide graph and sunrise/sunset data, plus, the pressure sensors in the altimeter retrieve vital altitude, atmospheric and direction measurements. It will also track your steps; your calories burned and has a compass to keep you going in the right direction. The dual-layer LCD allows you to switch to monochrome mode to preserve battery life and you can choose from multiple face designs depending on your mood or activity. Tested to military standards issued by the US Department of Defense, to ensure performance in rugged environments, it’s water-resistant to a depth of 50m. 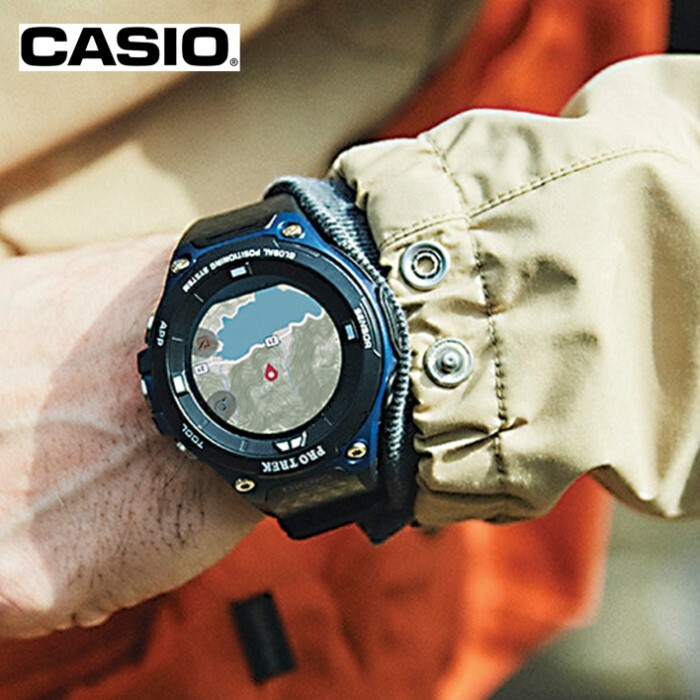 Purchase of the Casio ProTek Smart Watch includes a free 1-year subscription to the ViewRanger app for downloadable trail guides, outdoor maps and GPS navigation features. The ViewRanger app includes four offline map styles: USA topo, USGS topo, USA land cover and USA slopes; this also includes maps offered by NeoTreks. ViewRanger also lets you identify peaks and places with Skyline augmented reality feature and features unlimited offline map saving. This multi-function smart watch also features Wear OS by Google.